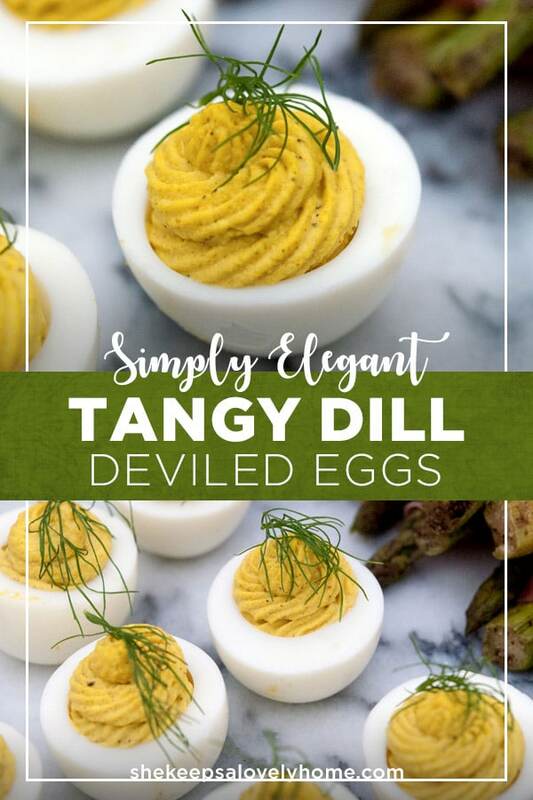 These dill deviled eggs are delightfully tangy and so very simple to prepare! All you need is a little dill mustard, creamy horseradish and mayo to whip up these tasty little conversation pieces. 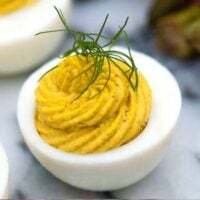 The dill deviled egg is truly one of my favorites. It’s such a complementary flavor, and dill mustards can be SO delicious! Sometimes, I like to serve my dill deviled eggs with pickle juice-soaked mustard seeds to really punch up the flavor and add some exciting texture, but for this one, a single sprig of dill was perfectly elegant. When throwing intimate cocktail parties for a few friends, I like to have a cheese plate, and then a nice little appetizer plate of 2 or 3 special treats. I always have deviled eggs on my appetizer plate, but I like to pair them with complementing flavors. With dill deviled eggs, I like to serve prosciutto-wrapped asparagus with goat cheese. 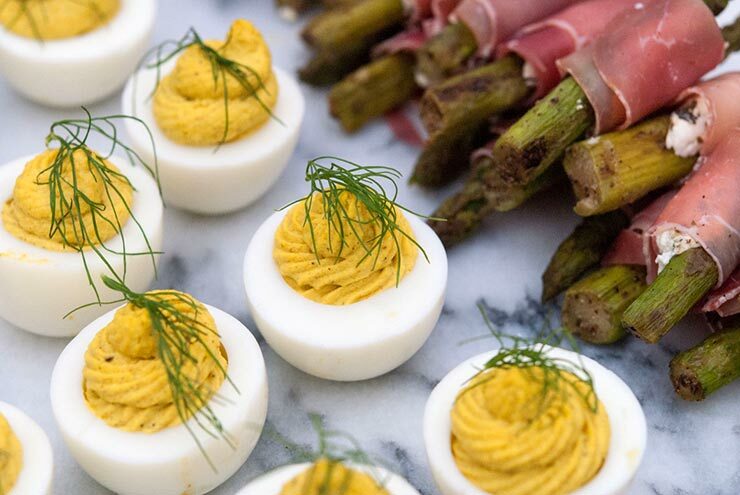 The tanginess of the deviled eggs and the sourness of the goat cheese is so nicely complemented by the prosciutto and asparagus. Nothing overpowers anything else. So once your eggs are cut and your filling is mixed, place the whites in a container in the fridge. Then, place your pretty tip in your pastry piping bag and seal the ends with a rubber band or twisty tie. Fill your bag with your filling, and seal the other end too. 10 minutes before cocktail hour, assemble your egg whites on a pretty dish, remove the rubber band around the tip of your pastry bag and fill your eggs. Even if your guests are fashionably late, your deviled eggs will look and taste fresh for at least a half hour. A Few More Deviled Egg Pro Tips! And for more inspiration, follow me on instagram and Pinterest! If you ever make any of my tasty drinks or treats, take a picture and tag me. I want to see! 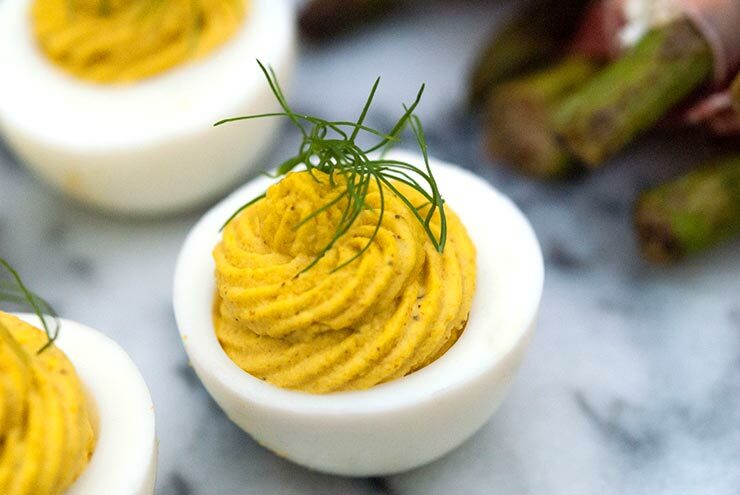 This dill deviled egg is delightfully tangy and so very simple to prepare! All you need is a little dill mustard, creamy horseradish and mayo to whip up these tasty little conversation pieces. Mix in 1 tbsp. of mayo, 1 tbsp. of dill mustard and 1 tsp. creamy horseradish into your egg yokes. Mix the ingredients carefully, making sure your consistency isn't too runny. Depending on the size of your eggs, you may have to adjust the recipe a bit to ensure your consistency is similar to hummus. 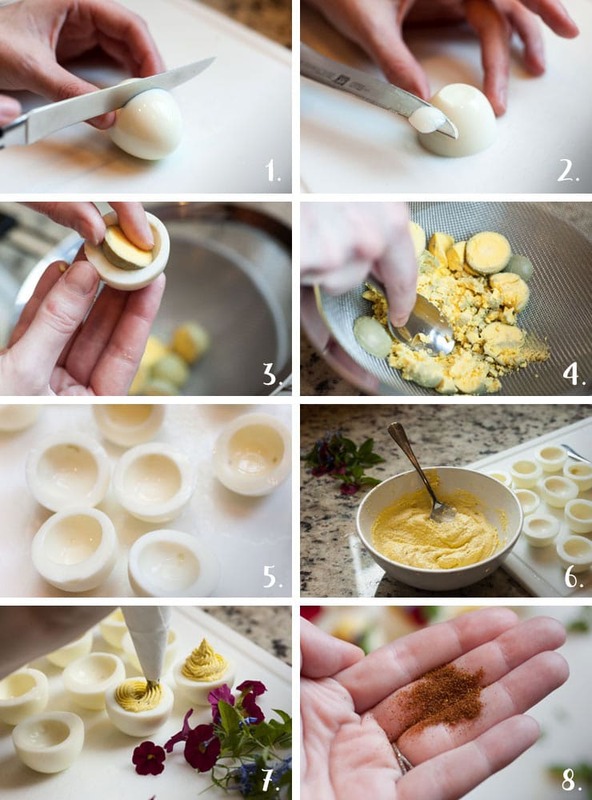 Pipe your egg filling into your little eggs! I would suggest always using a pastry piping bag to fill your eggs. They look so much more tasty and professional when perfectly piped. Garnish your eggs with a single sprig of dill. You’ll require a pot, mesh strainer and mixing bowl for this recipe. You may also want a pastry piping bag and tip to make them look nice and fancy.